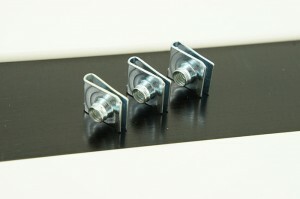 The PAS Clip Nuts contain a threaded extrusion which simply and neatly slides over the square rack rails and clips closed, saving masses of time as well as the potential of pain, bruises, stabbings, not to mention the complete and utter frustration that anyone attempting to grapple aged nuts into place will be familiar with. Once in place, the retaining bolt is then screwed through the Clip Nut in a civilised manner to secure the rack device or panel into place. A quick and elegant solution to an age old challenge. Currently PAS’s Threaded Rack Rail Clip Nuts are available as standard in black or silver, and with M6, M5 or 10/32 threaded holes. This will bring deep joy to all those in the professional audio and AV, broadcast, IT, home entertainment, security and other industries who are involved daily in installing equipment into19” rack mounting systems. It will also speed up the process substantially, especially for multiple rack population scenarios and seriously reduce stress. As word is spreading Clip Nuts are in big demand and PAS is boosting production to deal with the avalanche of orders.